The warm tropical waters and coral reefs teeming with fish mean that Seychelles is a hugely popular diving destination. The waters that surround Seychelles are home to over 1,000 species of fish and 300 species of coral. The islands are visited by giant Whale Sharks and manta rays, and are home to the critically endangered Hawksbill and Green Sea Turtles. 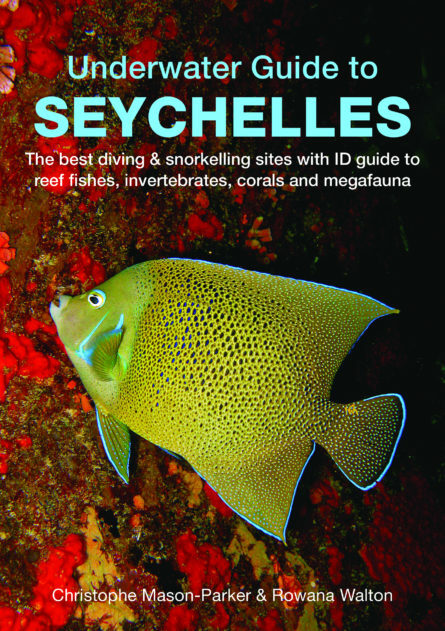 Divided into three parts, the book provides a general introduction to diving and snorkelling in Seychelles including what to expect and where to base yourself; a guide to the best sites for diving and snorkelling; and a photographic identification to 280 of the most common species of marine life covering fish, invertebrates, corals and megafauna. For all those who plan to spend time in or on the waters of the inner islands of Seychelles, this is the perfect, pocket-sized guide. –	Christophe Mason-Parker is a conservationist and a photographer who has long had a fascination for the marine world. Having worked on numerous conservation programmes from Southeast Asia to the Caribbean, he is now living in the Seychelles where he runs the NGO Global Vision International Seychelles. He has contributed articles to various newspapers and magazines. –	Rowana Walton holds an MSc in Biodiversity, Wildlife and Ecosystem Health, sits on the board of several NGOs and specializes in conservation communication and education. An experienced scientific diver, she has sampled the delights of marine life all over the world but still lists the Seychelles as her favourite diving spot. She currently works for the Seychelles Islands Foundation (SIF) which is responsible for the conservation and management of Seychelles’ two UNESCO World Heritage Sites.